Jason Quigley has announced he is turning professional - six months after becoming the first Irishman to reach a final at the World Championships. The 22-year-old middleweight from Donegal would have been one of Ireland's best hopes of a medal at the 2016 Olympics in Brazil. Quigley won his world silver in Kazakhstan in October, losing to local favourite Zhanibek Alimkhanuly. He has signed with Oscar De La Hoya's Golden Boy Promotions stable. The firm represents world champions Bernard Hopkins and Marcos Maidana and British Olympic bronze medallist Anthony Ogogo. 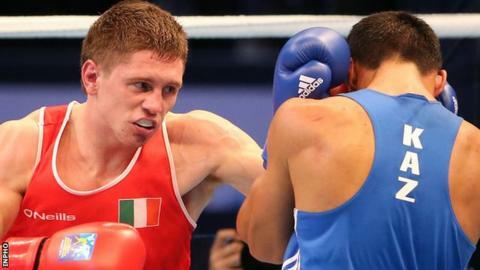 Quigley won the middleweight gold medal at the 2013 European Amateur Championships. Speculation that the Ballybofey man would be quitting the amateur ranks increased when he did not defend his Irish title in February.